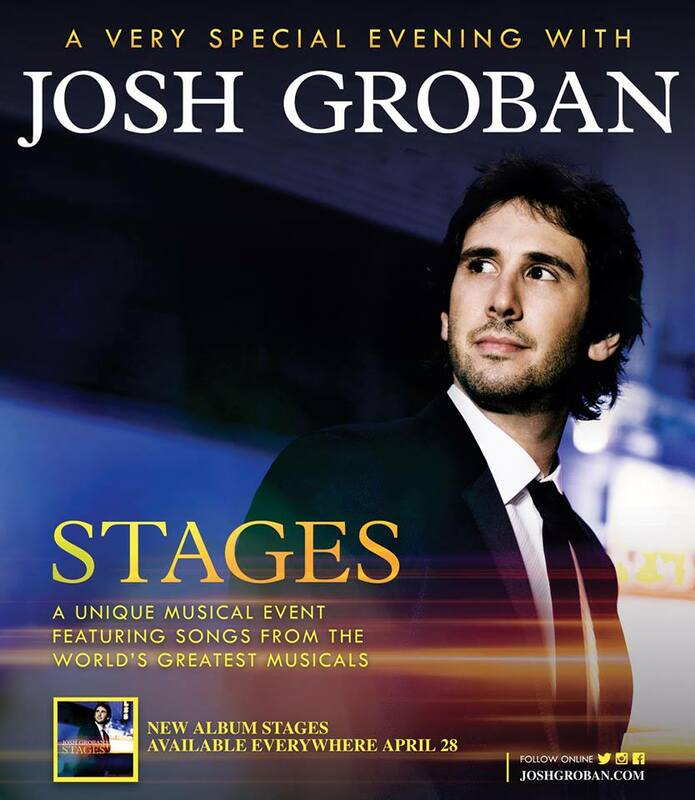 Josh Groban has announced a North American tour for the fall of 2015 in support of his upcoming album Stages, in which he'll be interpreting songs from Broadway musicals. The tour will begin on September 12 in Atlanta and wrap up November 3 in San Francisco. WHEN DO JOSH GROBAN 2015 TICKETS GO ON SALE AND WHAT’S THE PRE-SALE PASSWORD? Check below for whatever show you’re interested in, as each concert can have different ticketing. Friends of Josh Groban / Citi Cardmember / VIP Packages pre-sales will begin April 20th. Live Nation / LN Mobile App / Facebook pre-sales will begin April 22nd. Local / Radio pre-sales will begin April 23rd. The general public on-sale will begin April 24th. To participate in the first pre-sale, you need to sign up for the Friends of Josh Groban Fan Club. The Citi cardmember pre-sale password is your card number (you can also try 412800), the Facebook fan pre-sale offer code is STAGES, the venue pre-sale code is GROBAN, the Live Nation pre-sale code is PERFORMER, and the Live Nation Mobile App pre-sale code is COVERT. For Josh Groban's latest music, news, and tour dates, check out his Zumic artist page.